In the fourth quarter of 2018, RWA completed construction, commissioning and commissioning works on the Technical Re-equipment of the Tele-Mechanical Facility of the Kharkov Energy Control Circuit of the Kharkov Electric Power Distance (ECh-2) of the Southern Railway and prepared for commissioning an important facility of the structural division “ Power supply service ”of the Regional Branch Southern Railway of JSC“ Ukrzalyznitsya ”. In the framework of the project, telemechanization of the Kharkiv central power-dispatching center and telemechanization of control points of the traction substations and sectioning points of the contact network of objects were performed: art. Kharkov Passenger, Art. Kharkiv-Balashovsky, Art. Kharkiv-Sorting, and sections: Kharkiv-Zolochev, Kharkiv-Lyubotin, Kharkiv-Losevo (total of 15 control points). 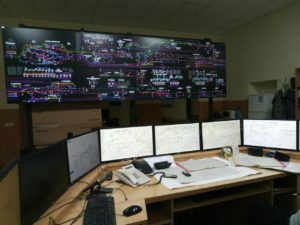 In carrying out these works, the Kharkiv central power-dispatching center was repaired, for which an additional (alternative) workplace of the power dispatcher was created, the outdated control and monitoring equipment was dismantled and a new modern microprocessor equipment was mounted. Indication of the state of monitored objects displayed on the video wall. At the checkpoints, the telemechanics equipment was replaced with a modern element base. The works on preparation of the facility for commissioning were completed by adjusting the system as a whole and by returning the power dispatcher to the updated workplace. This work was carried out on the project documentation developed by RWA in 2017.